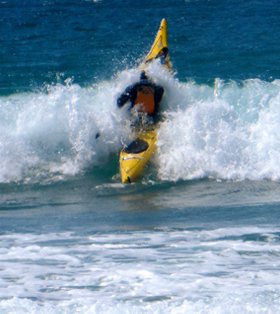 Tried and trusted: Over the past 25 years, BOA has emerged as a household name synonymous with sea-kayaking and adventure tours in Baja. 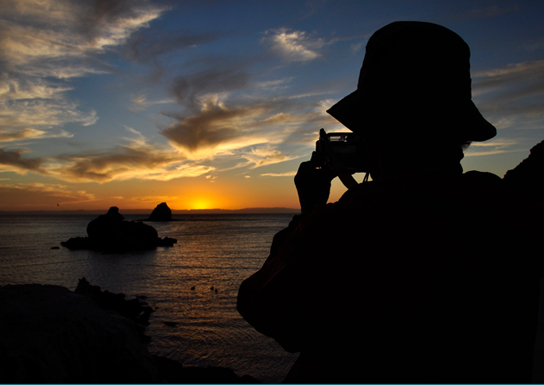 We have proudly guided many thousands of travelers on the Sea of Cortez and Baja´s last wilderness frontiers over the years. 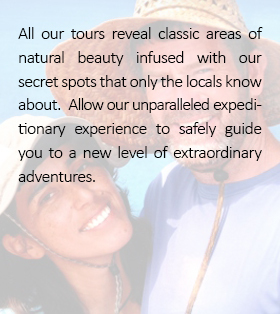 We are also the trusted Baja experts for many international outfitters and travel booking agents. Top flight equipment: We carry a large range of state of the art kayaks from some of the top North American manufacturers. Our sea-kayak fleet and expedition gear is imported from leading manufacturers while our fleet of motor boats is the best in class, and stringently maintained. Experienced, local guides: BOA guides are legendary possessing skills and knowledge that regularly surpass the expectations of our guests. Safety: When trouble is brewing, you will want to know that some-one is watching your back. There is simply no substitute for having a local company that knows what to do in an emergency. Pricing: BOA trips represent fantastic value for your money. As a local company with lower overheads we offer attractive trip fees especially when compared with international outfitters that are selling trips abroad. 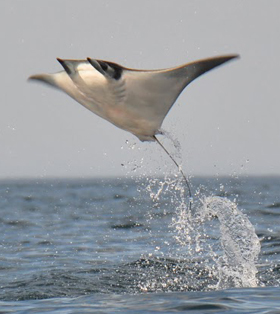 Experience: Our team has over 100 years combined knowledge of operating trips in the Sea of Cortez. 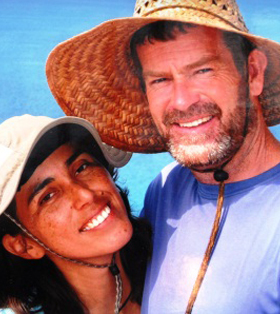 Founders Ben Gillam (a sea-kayaking coach from Wales) and Alejandra Guzman (a native of Mexico and Baja California) opened BOA in 1994, sharing their passion for the region with classic, expeditionary style trips. Safety: On rare occasion, Mother Nature can run riot. When trouble is brewing, you will want to know that some-one is watching your back. There is simply no substitute for having a local company that knows what to do in an emergency. Our guides (link to legendary guides) go through intensive training, in addition to the years of experience they have already gained. They are all Bi-lingual, Wilderness EMT certified, and are regularly tested and trained in Baja Natural History, advanced kayak skills, navigation and trip planning and other essential outdoor skills. Advance weather system: We are a company that is continually anticipating the weather; few competitors offer this level of attention. We count on a tried infrastructure for communicating with the field, and we send updated forecasts even to the most remote trips. 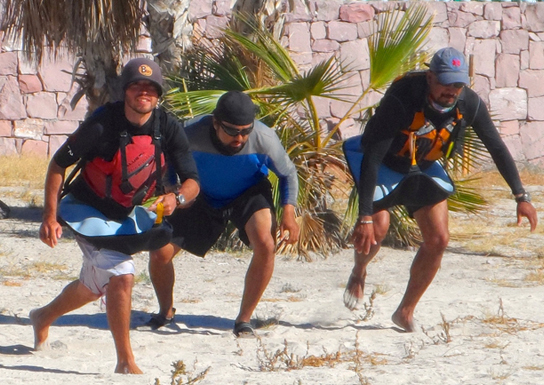 Our back up system is fool proof and is right here in Baja. By "going local", you ensure that your investment leaves a lasting impact in this special corner of the world. 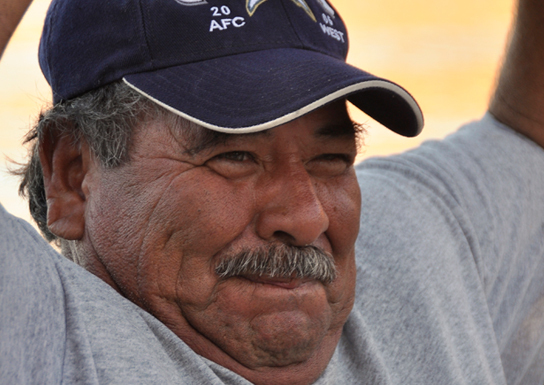 We have lived and worked in Baja Sur for 25 years. When you join our expeditions, we share our love for this region and community - hidden gems, deep knowledge about nature and wildlife, chats with local fishermen; subtle details that you may be challenged to find elsewhere. Local jobs and opportunities: We strive for 100% local employment - the majority of our boat drivers, cooks, maintenance, guides, office staff and management all live in La Paz or in a nearby town. We provide a respectful working environment encouraging employees to continually learn and optimize their own experience. 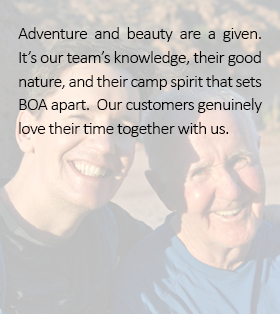 We strive to create a sense of care for each other, our guests and the companies that work with BOA. Buying local: where possible, we buy local produce in La Paz shops. We recycle anything that is recyclable and trade with local businesses for homemade food: tamales, tortas, ceviche, bagels etc. Supporting local conservation: We support the environmental agencies that work hard to protect the national parks and biosphere reserves that we operate in. We also donate trips to local institutes and companies that share our aim to conserve this area. 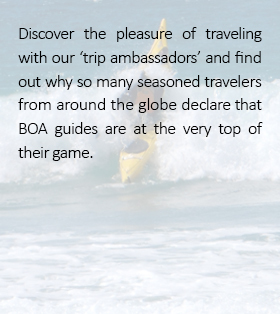 Discover the pleasure of traveling with our "trip ambassadors" and find out why so many seasoned travelers from around the globe declare that BOA guides are at the very top of their game. Meet our team. These individuals are passionate about their home and the beauty of Baja and cannot wait to impart their rich knowledge of its natural wonders. 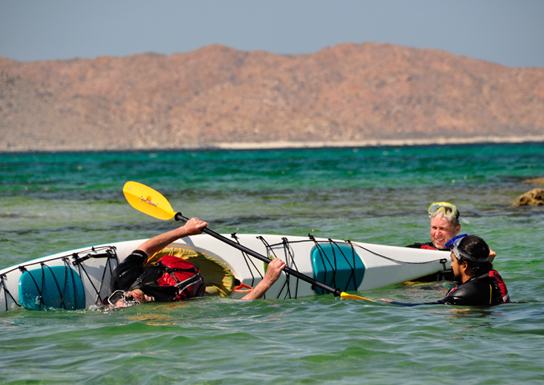 Relax in the company and expertise of our guiding team. Their professionalism and decision-making will allow you to revitalize and immerse yourself in the warmth of Baja, its people and the unique wonders in the Sea of Cortez. Great cooks! We consider the catering side of each trip a major part of your over-all enjoyment. It therefore may go as no surprise to read that many repeat guests are "just here for the food!" It really is that good. Think healthy Mexican food with lots of fresh fruit and vegetables. Freshly caught fish, bountiful seafood and many more wonderful surprises. Vegetarians and people with special dietary needs are offered quality alternatives. To complement our delicious meals we provide beverages throughout the day. Begin each morning with freshly brewed coffee or tea (black, green or herb) and fruit juice. Soft drinks and beer are available on our fully catered trips and all our expeditions have wine served with evening meal. A happy hour before dinner helps set the tone as the day winds down and the sun sets after each active day of adventure. 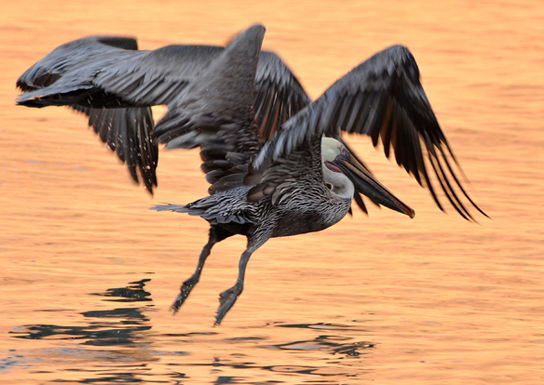 Our business depends on the health and protection of the local natural world. We devote substantial time and resources into conserving this place we call home. 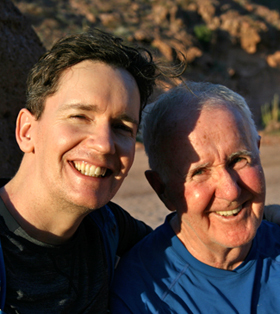 Core Values: As a member of the Adventure Travel Trade Association (ATTA) we are committed to the core values and principles of this organization. Essentially, we aim to reduce our carbon footprint and support our local community. Support local authorities: We support the environmental agencies that work hard to protect the national parks and biosphere reserves that we operate in. We also donate trips to local institutes and companies that share our aim to conserve this area. Advancing education: from time to time we work with local schools to provide a platform for learning about the great outdoors. 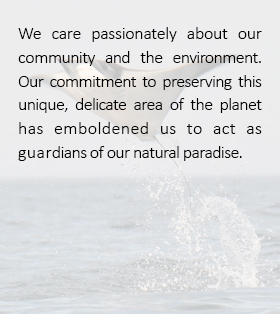 We teach outdoor ethics and the importance of preserving our local environment.